So a few weeks ago, I decided that I would try a product called Bee Mine Luscious Moisturizer. I have to give this product 5 stars!! It locks in the moisture and you only need a dime size amount. My daughter's hair loves this product and my hair loves it too!! This will definitely be a staple and probably replace my generic brand Paul Mitchell leave in conditioner. 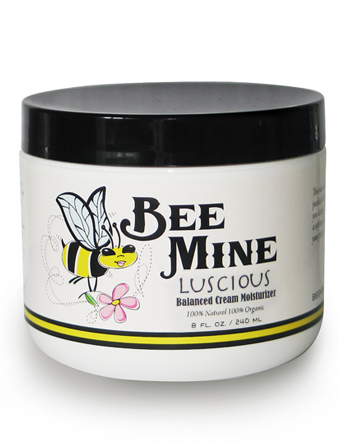 The Bee Mine moisturizer retained the moisture in our hair for a longer period of time, leaving the hair very shiny. The only thing I don't like about this product is that you have to purchase it online, but shipping was rather fast. Hopefully, Target will start selling this soon!! Ingredients: Distilled water, Hydrogenated Persea gratissima (Avocado) Seed Oil, Mangifera Indica (Mango) Seed Butter, Cocos Nucifera (Coconut) Oil (and) Aloe Barbadensis Leaf Extract, Butyrospermum Parkii (Shea Butter), Persea gratissima (Avocado) Oil, Simmondsia Chinensis (Jojoba) Seed Oil, Emulsifying wax, Hydrolyzed Wheat Protein, Paraben & Formaldehyde Free Preservative & Fragrance (Coconut Cream - CC) (Island Mango - IM or Original Scent).